You can improve your egg quality. 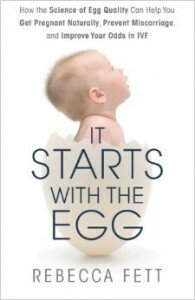 Your eggs have been a part of your body since you were a developing fetus in your mother’s belly. Everything she ate and thought and did gave information to your cells about how to develop. Everything you have eaten and drunk and felt has informed your cellular development since birth. And your eggs have been witness to it all. Once you are ready to start a family, the lifestyle habits you have may not be supporting the health of your eggs and may make it more difficult to get pregnant. That’s what happened to author Rebecca Fett. This book was written by a women with a scientific mind and the heartbreaking experience of going through fertility challenges. She took her situation and used her background in molecular biotechnology and biochemistry to dig deeply into the research around lifestyle and egg quality. Her own story is almost as compelling as the over 500 research articles she has drawn on to bring together this easy to understand, level-headed, fact-based resource for improving egg quality. Covering everything from environmental toxins to supplements (including the ever controversial DHEA) to diet strategies for both men and women, this book gives guidance for it all. A valuable resource if you have been diagnosed with low ovarian reserve, poor egg quality or PCOS. I find her dosage ranges for supplements to be conservative, but I always encourage women to seek out the advice of a naturopathic doctor for personalized care when it comes to supplementation for fertility. The evidence she has gathered about supplements in pre-pregnancy is compelling enough to look into this further. I highly recommend this information packed little book. It could make all the difference!